RIM is counting on BlackBerry 10 to turn itself around, as evidenced by an investors' call Thursday in which company CEO Thorsten Heins and other executives outlined the strategy for the operating system and how it fits into RIM's bigger picture. Heins emphasized that BB10 is more than just a single product - he told investors it's an entirely new system, allowing RIM to run a "competitive portfolio" of mobile devices. "We believe BB10 will advance the OS environment to the next level," he told patient though persistent investors. One investor quizzed Heins on where BB10 handsets will fall in the market, putting emphasis on whether devices at the entry-level will carry the OS. "BlackBerry 10 will proliferate the mid-tier," Heins responded. "We are working on a concept into the entry level, so you might see an entry-level phone next year." The company reported $235 million (UK £144, AU $225) in losses in the second quarter of fiscal year 2013, and while its revenue grew 2 percent from last quarter to reach $2.9 billion (UK £1.78, AU $2.78), it's down 31 percent in revenue from the same time last year. With those figures at the forefront, investors were keen to question just what part of the market RIM intends BB10 to occupy. One asked how the company plans to change customers' minds who are already committed to a certain smartphone before they walk into a retail store. Heins responded that a marketing campaign to educate customers about the benefits of BB10 before a product launches is key to making pre-sale conversions. Another challenge RIM faces in making BB10's launch a global success, another investor pointed out, is that RIM has lost retail shelf space to other manufacturers. "We are launching in 16 countries," Heins said, noting the enthusiasm BB10 has been met with by carriers around the world. "We are absolutely capable of running a global launch. We can manage and execute it." 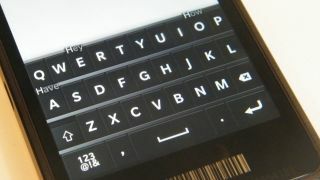 RIM is also developing both full touch and QWERTY BB10 devices, the CEO said, allowing for a robust entry into the market. Heins told investors BB10 leads in HTML 5 browsing speed, even beating out desktop computers. What's more, it's already got a one-up on Apple's iPhone 5. "The display in full touch will be beyond what iPhone 5 launched with," Heins said. "It will actually be true HD."